Nestled in a high sierra valley, at the foot of Mt. Ashland is the town of Ashland, Oregon. Home of the Oregon Shakespeare Festival, Lithia Park, and the nearby vineyards and chocolatiers of the Willamette Valley, it is also renowned for its crisp mountain stream and natural sulpher springs, which have been hailed as the “Fountain of Youth”. To my knowledge, the sulfur springs of Lithia Park are no longer available to drink from in the town square fountain, but when I visited as a child, the fountain did flow, and I drank from it. It tasted like rotten eggs, but its effects were true. I was enchanted with never ending youth and the longing to return to this place year after year. As an adult, I return with my husband for short reclusive getaways to relax, stroll the park and shops, and take in the theater. In the winter we drink coffee with the local elders before a leisurely day on the friendly slopes of Mt. Ashland. On one such trip in 2008, we awoke on Christmas morning to find a soft light powder of snow had fallen in the town. For a few hours we padded about, wallowing in the quiet moments as the new day began. The paintings that followed seemed to integrate nature, architecture and light, with the hint of man only visible in footprints, tire tracks and the statues that govern the place. 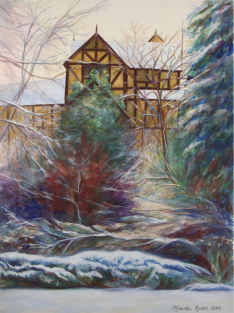 The paintings of this series are the results of that morning and the quiet tranquility of the town in winter. Link to Ashland Series. Set on the coast of the San Francisco bay in Marin County California, is an abandoned settlement once inhabited by shrimp farmers from China. The village is now a state park, and the original settlers have long since moved away, but the village buildings remain, along with the spirit of life as it was. One Fall day I found myself there to paint with a friend, perched in the Eucalyptus groves, high on a hill overlooking the beach and dark stony cliffs that mark the barrier between this timeless world, and the busy city just around the bend. In the distance you can see Richmond, refineries and all, and a passing barge maybe on its way back to China. That day brought buses of teenagers, milling about the pier, and a fisherman tending his boat just past the painted beauties that no longer sail. There was a lady who sat sanguine on a lawn chair, chatting on her cell phone, and the trees laughed at me as I walked the place with camera and a happy heart. The photos I took were a little bit lonesome, even with kids passing intrigued with the place, maybe because people come to visit and enjoy the day but no one stays through the night anymore. I started seriously working in interior design while I was still in college studying illustration. Houses and their unique character have always been an important part of my work. This month I had the pleasure of presenting to the East Bay Artist Guild on the topic of "Art from an Interior Designer's Point of View". Having worked in the field for over 20 years, it was quite an experience to go back through the years and consider what I know that I could share with fellow artists. I started seriously working in interior design while I was still in college studying illustration. Houses and their unique character have always been an important part of my work. At the high end, where I mostly worked, I was in the practice of keeping the visual artist in me far from the design office. The motto was "don't try to be both to your clients". To combine the two in any way (other than just using skills to execute the interior design process) would be considered a poor execution of design. But the artist in me could appreciate and help promote the work of other artists if I had the opportunity. Some of my basic tips for artists have to do with realizing that designers are professionals in business, and when working with artists, they expect the same. To transact with designers on a business level, artists must provide adequate levels of documentation of their work to facilitate the designer's ability to promote and sell it to their clients. In this day of electronic everything, the more electronic renditions of the artwork, promotional materials, business documents, sales platforms, and social media venues, the better. The long and short of it is, if our clients and customers are going online, then so must we! It was fun to sift through photos of binders and reams of documents that used to make up a design office, and to know, that while some are still using fax machines, the large majority are fully digital, and pushing less paper and more "paperless". With these lessons in mind, to consider my own art practice, the value of the actual artwork becomes more nostalgic with each technological advancement. Digital and print reproductions are easy to create and will continue to get easier and better. Certainly, the implementation of digital age business practices is an on-going and ever changing preoccupation for all of us. But as we continue to chase the electronic moving target, the real deal original hand painted artworks, in my estimation, will only get more valuable. I find myself evermore excited and committed to making original art, one painting at a time! A gesture is a small action that makes a meaningful impact. When we feel strongly about another person, we might say with a card or flowers what we are embarrassed to say outright. The less we say, the more impact we make. Give a piece of chocolate and you are on your way. Gestures in art works the same way. In gesture drawing we find a mental and physical state that is relaxed and loose. We use the medium to make simple, quick, fluid marks that “capture” the subject. A few simple lines can tell the whole story. As a musician practices scales, an artist does gesture sketches before embarking on a longer painting. We go after the essence of the form and sometimes the gesture in and of it self can be extremely beautiful. Like a memorable moment a gift is received, versus a lifetime of shared days. The gift giving marks a moment when we recognize our life together and what it means. Some artists find gestures challenging perhaps because not every drawing turns out. We fear, “how can I capture the feeling?” If it doesn’t look “good” it could have the opposite effect than we intend. I think we are sure to fail if we judge our selves too much in the process of art making, for we might quit before we even start. We have to open our heart, mind and intentions, and just give it our best shot! We don't know how the gesture will turn out, and we really can't control it very much. What we can control is our actions, with each try, one at a time, with genuine thoughtfulness and practice seeking the essence. If we can express our impressions and feelings with a lasting mark, then we can call it art. 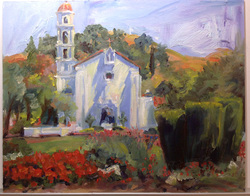 St Andrews Church was the venue for the East Bay Artist Guild Group Show from September 5- November 1. Located on Mary Drive in Pleasant Hill, CA the wall space is in a large contemporary building adjacent to the Church where gatherings of the congregation occur. It is fitting therefore, that our group gathered with our many varied styles and medium of art to show together in this venue. The amazing experience I had was in the hanging of the show. I had intended to go, drop off my 2 plein air oil paintings and duck out in time to avoid being roped into helping hang. Of course, in a church venue, guilt becomes the prominent emotion, so I did not get far. In fact I stayed to offer my services and support to hang the show so we all could get out in a timely manner. Well, what was so fun about this process, was that as we looked at the work, it all seemed rather disparate. Nothing seemed to mesh, or match, we started placing work around the floors of the walls to try to create some sense. It was not until all of the work was out, that we started to reorder things, re organize and start to compose the walls with the unique works. The more we pushed and pulled at the art of hanging, we arranged things according to subject, color drama, and visual weight. Soon order began to unfold and the spaces- there were 3 rooms- began to take on a new glow. It was a rather divine experience seeing all of these paintings, drawings and photographs come together in a kind of harmonic convergence. There was no rhyme or reason to the show in the beginning, no intent to make a theme or an underlying idea of symmetry. Instead it was just a free for all. Bring whatever you want to show in a church. No prices, or lists. Just art for the congregation. So when we finished, and it really did not take long, we all felt refreshed, awakened, enlightened by it even. We had created a work of art out of the decorating of the art! We had created order out of chaos, inspired by no plan other than the divine ability we have to make patterns, associations and relationships where there were once none. It was a moment of artistic truth, when we all came together and made something bigger than just our one contribution did alone. You can't really tell from the photo, but I'm pretty sure God was there, and it turned out Divine! Lefty Loosy - Righty Tighty! Here is painting that I started a few weeks after having surgery to my right shoulder in March. The right hand is the right one I paint with, so I had to use my left hand to start this piece. As I recovered, I finished it with my right! Can you tell which part was done which hand? It is from a trip to Delphi, Greece, the home of the ancient oracle at Delphi where travelers are invited to come to the oracle and “know thyself”. We ate at this exquisite and ever so charming restaurant. I loved that wagon and had to paint it! A great way to ponder oneself on a hot summer afternoon. Between that and 3 months in a sling, I have got to know myself really well. 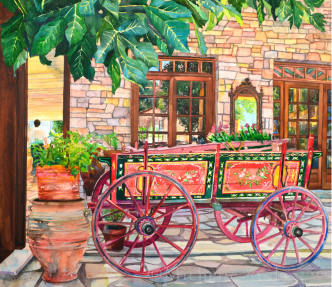 See more paintings in my Greece Series. 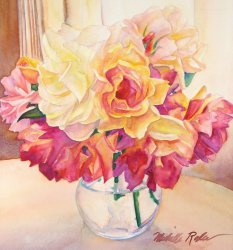 The first two weeks in June I held my first East Bay Open Studios at my studio in Walnut Creek. I was thrilled to have a space to show my work and despite feeling a bit of a fraud since I had not painted in 4 months due to the surgery and recovery time, I was determined to have the show. The whole process was exciting, to chose the work (it all goes up, framed or not) and all the boxes of more work that didn't fit on the walls got to be nearby for instant access viewing. And then there was the fun of hanging the work one handed, with my left only, and using any and all other available body parts to help hold up hooks. My favorite thing about it was the people who came. They found the place regardless of my questionable signage, which, placed parallel to the building, rather than perpendicular, rendered it as about as effective to oncoming traffic as a pencil would be. And they came into my little haven, next to the janitor closet, around the corner, thanks to my in the building signage, every 5 feet saying " Keep Going... You're Almost There...Don't Stop Yet." Those who made it, were truly hearty souls and they honored me by coming! What was so terrific, was that each person who came through, had a different take on the the artwork. There were samplings of many works, all there for each person to look through and find something that was meaningful to them. One person actually declared a "winning painting" from my inventory. I was entirely amused, because she was the only person who showed any interest in that particular painting, and yet she was sure it was the very best one. February 24- May 11, The show at the Diablo Valley Library was themed Earth Day, in honor of the month of May and all of its earthly glory. I chose to include this painting of Mount Diablo which I painted while gazing at the mountain one early Spring day. What I love about Mount Diablo is that is stands solid so near us in Contra Costa, like a big guardian that keeps the area grounded and safe. Funny that it was named Diablo (Devil). Sure it gets HOT around here, and that would muster images of hell and whatnot during the Summer, but in Spring, Fall and Winter, when the air is crisp and cool, that mountain is more on the Angelic side. When I painted this, it was from my favorite little perch up on Acalanes Ridge where there are trails that cross sideways along the steep golden hills. In fact, it mirrors the terrain of Diablo in the distance. And from this spot, I can see not just the infamous mountain ahead, but also the whole of Contra Costa, from Richmond, Crockett, Benicia, Pleasant Hill, on through Walnut Creek, Lafayette and on down the 680 corridor to Danville, San Ramon and on. I just love this area! The trails, the open space, the sub-urbanity of it all! How fitting was that painting for a show at DVC that services the student body of this area. But even better was when the painting sold, it was to a neighbor who walks these very hills daily. He is a dog walker, and he could spot the view the instant he saw the painting. It was familiar and it reminded him of the glory he gets to experience everyday. Its moments like those that make my day! The Metropolitan Transportation show in Oakland, March 6 - May 4, 2013, was a group show for the East Bay Artist Guild. Sadly, I was not able bodied enough to attend, as I was undergoing surgery and intense recovery from it on my right shoulder for the Months of March - June. I did not paint or get out much at all really, during that time. water, waiting to transport him somewhere, but I have not a clue where that might be. I just love that about transportation. It can take you any where if you are able and ready. Ironically, I spent so many months this year not able or ready to do much at all, so the forgotten beached fishing boat would have been just my speed. What I love about illustration is the marriage of pictures with words. A blog puts the two together so well! Which one makes the point come across better?